In the previous part of this series, I described the goal setting template for a high output life. But what it lacked most was a guide for daily execution. A method for waking up every day, doing your most important work, and reliably making progress towards your daily, weekly, and quarterly goals without having to worry about procrastination, setbacks, or delays. Here, I’ll explain the daily system I use to be more productive. It’s based on heavy experimentation, extensive research, and the habits and systems of some of the most productive people I know or have read about. The evening planning sets up the next day to be productive. The morning routine lets me start the day calmly with good inputs. And the daily execution is when I move through all of the work that I’ve set myself up for. The systems is designed to make productivity effortless, to minimize the amount of self-control I need to exert on a daily basis to do my best work. It’s a way to make productivity a habit. The implementation explained here is focused on building a productivity system, instead of cobbling together random productivity tips. Tips aren’t helpful without a strong system in place, and trying to implement the “10 things you can do today to be more productive” won’t be nearly as helpful as designing a high-output system. I encourage you to resist the urge to return to unhelpful sites such as LifeHacker, Inc, and Entrepreneur, and try implementing a structure more like this instead. I prefer to think of my work days as going from around 6pm to 6pm, instead of in the normal “day” cycle. My day “ends” around 6pm, which means I have to wrap everything up and plan the next day. It helps me avoid working into the night, since once 6:01 hits, I have 24 hours to get the next set of tasks done. I do my planning for the next day at the end of one day instead of at the beginning of the next one. I find this makes me less stressed in the morning since when I wake up, I know exactly what I need to do for those first few hours, and never need to check email, Slack, or even my task manager. And by planning as I end my work day, all of the open loops are still fresh in my mind. If I planned in the morning, there would be an inevitable period of trying to load my different tasks and projects into my head before being able to decide what to do. The goal of my evening plan is to know exactly what I need to work on tomorrow. The biggest impediment to maintaining a high output is not being clear on what to work on next. Procrastination is usually a symptom of unclear next steps, or insufficiently easy next steps. The latter is solved by good chunking, the former is solved by good planning. My evening plan lets me create a nonstop flow of productive output by knowing exactly what I need to work on throughout the day. I never want to have to think about “what should I be doing next,” and this system allows for that. One warning before we continue: This is going to seem really complex and like it takes a lot of work at first glance. 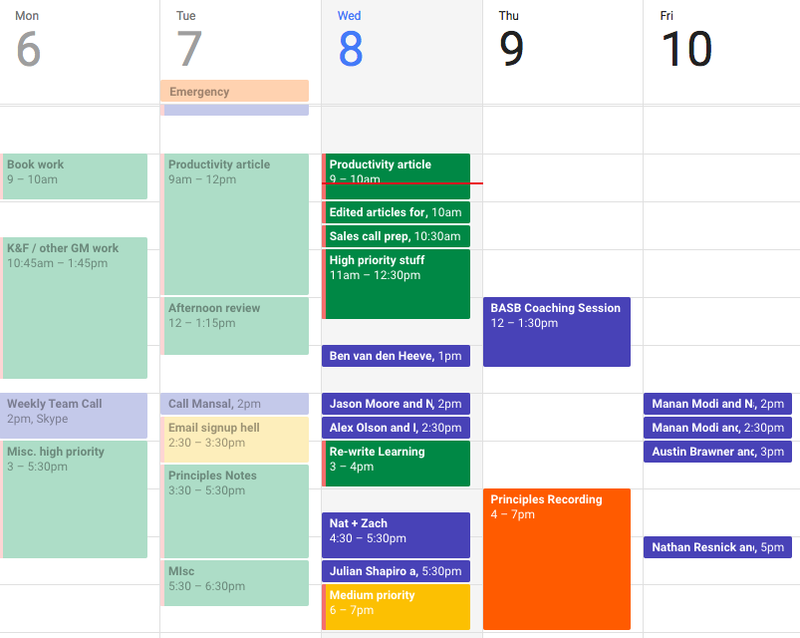 But trust me, a daily planning session like this takes less than half an hour, gets you to inbox zero, collects all of your tasks, plans your entire next day for you, and lets you spend your evenings and mornings stress free. It is amazing how much this will increase your output, and it is well worth the 15-30 minutes it takes you each evening. I start by collecting every single potential task or thing I need to do from all of the usual places. As I collect them, I send them to my Things inbox using the Mac hotkey (CTRL + SPACE for me) so that I can collect all of my new tasks quickly without leaving the apps I’m finding them in. One really, really important point here: When I’m going through Trello, Slack, and ESPECIALLY email, I turn everything I see into a task in Things. This lets me keep all of my tasks in one place, and saves me trying to manage multiple to-do locations. It also lets me get to Inbox Zero in 5-10 minutes. And with the Things Helper, you can use a separate hotkey (CTRL + ALT + SPACE for me) to include a link to the page you’re looking at in the task. That means that for each email that requires an action, I can save it as a Things task and then archive the email. By the time I’ve checked all of them, they’ll be empty or cleaned up and everything I need to read will be in Instapaper, all of my information will be in Evernote, and everything I need to act on will be in Things. This is an absolute game changer for productivity and I can’t recommend it enough. It’s only the first step though. Once I’ve placed everything useful in Evernote or Things, I need to process those inboxes. First, I’ll go to Evernote and work through every article in my Evernote inbox and file it into whatever notebook it should be in. For more on specifically how I use Evernote, check out Tiago Forte’s guide. I completely copy his method right now. Then I need to process my Things inbox. This is also partially based on a resource by Tiago, with a few personal adjustments. Finally, once each task is tagged, I place it in the corresponding Project or Area for that task. Now that everything is processed, it’s time to review it. Once everything is tagged and added to its respective Area or Project, I’ll go through all of the tasks listed and clean them out or update them. Once the review is done, you should have a nice, organized, tagged list of every task you currently have on your plate. Now from within your list of Anytime tasks, start deciding which ones you want to focus on tomorrow. Start with your Top 3. Pick the three “High” tagged tasks that, if you accomplished them, the day would be a success. They’ll most likely be part of your weekly goals. Change their priority tag to “Top,” and set them for Tomorrow. Next, add in more “High” tagged tasks until your total time commitment for High and Top tasks tomorrow is around 6 hours. This doesn’t have to be exact, but it gives you a good guideline to make sure you don’t load up too much stuff to do. 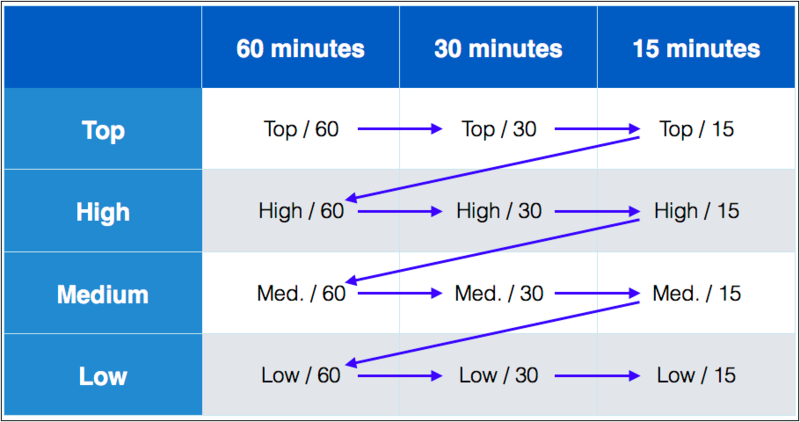 Then, go through your Mediums and Lows to add in another 1-2 hours of tasks. You don’t have to add them, of course, but they’re typically things you should get done eventually so setting aside time for them each day helps. I tend to overestimate how long many of these tasks will take, so scheduling 8 hours works out well. But if you find that you’re underestimating, you may have to adjust how much you schedule your day for (or improve your estimates). You can also find your “Mezze Point” for how many tasks you should list, and plan based on that. That takes care of all the planning. Now it’s a matter of execution. I don’t start working as soon as I wake up. I like to set aside at least an hour in the morning to relax, take some time for myself, and make sure I’m going into the day deliberately instead of reactionarily. The point of the morning routine is to start your day strong, happy, and in control. If you start it frantically rushing to get out the door, or responding to emails, you’re not in control. You’re starting the day by giving someone, or something, else control over you, and that sense of not having control will affect you for the rest of the day. So I start the day in control, by doing something semi-productive that will make me feel good. Mine’s simple. I wake up, start boiling water, and drink a mixture of Athletic Greens and Matcha MCT oil while I wait. Once the water is ready, I’ll make tea and sit on the couch to read for an hour, taking a break at some point to make more tea (I’m really liking Lapsang Souchong right now). Some people make their morning routines much more involved: journaling, meditating, affirmations, tantric yoga, but it doesn’t have to be a superhuman regimen. I like reading. And tea. And that’s how I want to start my day. And by spending an hour a day reading I get through quite a few books. I’ll typically wake up at 7, do my morning routine till 8:15, then head over to Starbucks to start work at 8:30. I don’t eat breakfast since I’ve been doing 16/8 intermittent fasting for seven years now and I’m not sure I can ever go back. If I didn’t do it the night before, the first thing I’ll do is block out sections of my day for the tasks that I have on my to-do list. I’ll use color-coded chunks based on priority (green = top/high priority, yellow = medium priority, red = low priority), and then as the day goes on I’ll go back and adjust how much time things actually took so I can improve my estimations over time (this is based on a technique from Taylor Pearson). If there’s something I absolutely need to do at a specific time (like prep for a call in the afternoon) I’ll put that in as its own event, otherwise, I’ll frequently just write in “high priority” or “medium priority” to reduce how much time this outlining takes. Blocking out your calendar like this significantly improves your time management. You’ll get a sense of whether or not you’ve overloaded yourself for the day, and at the end of the day you’ll be able to look back at what you did and see where you might have gone wrong (or right) to improve your plan for tomorrow. Then the day starts. I’ll look at everything I planned for my day in Things and outlined on my calendar and get to work, moving through the tasks based on a combination of their priority and time expectation. This way I’m taking advantage of when I have high energy in the morning to produce my best work, and then shift to the less important tasks as the day goes on and I get more tired. I start at tasks tagged as Top and 60, my most important longest-taking tasks, then go through Top/30 Top/15, drop down to High, and repeat. By filtering tasks in Things, I can look at just my Top, High, Medium, and Low tasks in order, then execute on the next one based on its time estimate. I start with the long tasks since they’ll also tend to be the most energy intensive. This system is amazing for preventing multitasking. If you always know exactly what’s coming up next and what you should be working on now, you won’t feel so compelled to try to do a few things at once. You’ll move step by step through your list of important tasks, without feeling the need to jump around. As the day goes on, if I come across any tasks that I need to add to my list I’ll add them using the Things hotkey (CTRL + SPACE). If I find anything I need to read, I’ll save it to Instapaper. I usually work from 9 until 12 without checking email at all. My team can message me on Slack, and anyone else I work with who has a true emergency can always call me. Around noon, I’ll do my Afternoon Review, which is similar to my Evening review. I go through my calendar, Trello, email, and anywhere else important stuff might have cropped up. I’ll drop them into their appropriate places, then go through my Things inbox and see how everything should be tagged, categorized, and if necessary, scheduled for today. This usually takes 15 minutes and is best done a bit before lunch, followed by some reading. By doing it before lunch, you can come back from lunch knowing exactly what you need to work on. And by following it up with some reading, you leave for lunch primed with new ideas to think about instead of spending lunch worrying about everything you need to do. Then the rest of the day progresses the same way. If I complete everything on my list before 4, I’ll add a few more things to get ahead, but as soon as I get through it after 4, I stop for the day, do my evening review, and then go do whatever else I want. One of the bad habits that I struggle with is not wanting to start some task and ending up on social media. There are a few ways to prevent this. First, it helps to clearly define the first or next step in my task manager so it’s not something obscure and hard to act on. But even when that’s in place, I might still procrastinate, at which point I bring out the modified pomodoro technique. In the normal Pomodoro technique, you work for 25 minutes, then take a 5 minute break, taking a longer break every three or four pomodoros. It’s great for studying, or for doing repetitive tasks that you dislike. But what I don’t like about it is that it doesn’t work well with creative deep work where you want to get into flow for an hour or longer. What I do instead is set a timer for 25 minutes without an alarm. I tell myself that when it hits zero, I can stop, but that if I’m in a groove I’ll just keep going. What I find is that by giving myself permission to stop in 25 minutes if I’m still not feeling it, I’ll get started much faster, and typically continue well past the 25 minute mark. 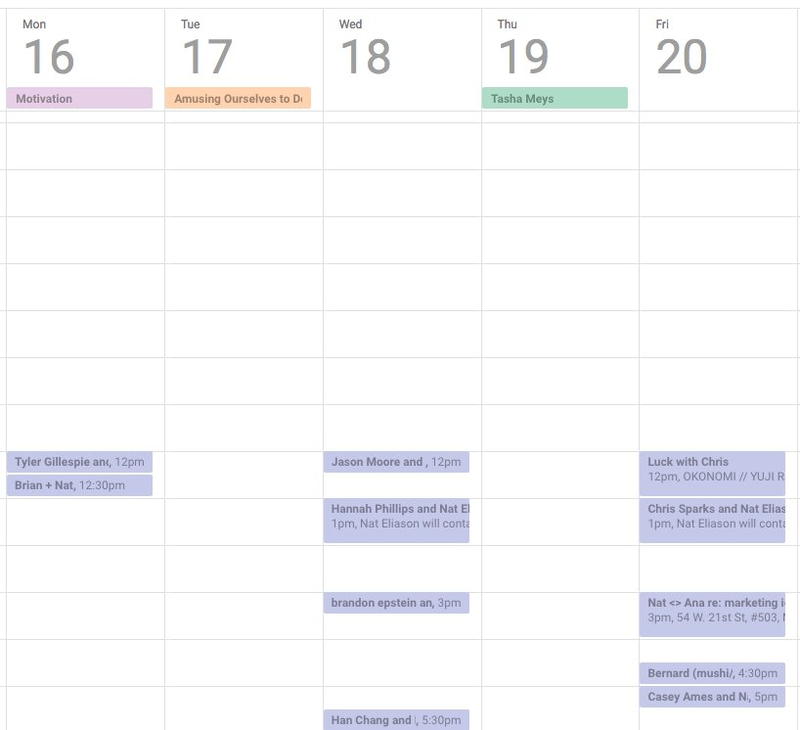 This one is simple: keep your calendar organized by constricting what kinds of events can be on what days. For me, that means that all calls, podcast interviews, and anything involving talking to other people only happens on Mondays, Wednesdays, and Fridays, and only after 12pm. This way I have dedicated writing and deep work time in the mornings, and I get Tuesdays and Thursdays completely devoted to deep work. I also don’t take any meetings the same day unless something is on fire. The last thing I find particularly helpful in this daily system is to use cleaning and organizing as a way to combat anxiety and overwhelm. As soon as I start to feel like the sky is falling or I have way too much on my plate or like I don’t know what to do, I’ll close all of my browser windows and apps, clean my workspace (or part of my apartment), and then come back to my computer. This takes less than five minutes, and it completely cures the sense of overwhelm. I can’t recommend it enough. There’s quite a bit here, and it might seem overwhelming to start doing all at once. Here’s what I recommend for implementing it. 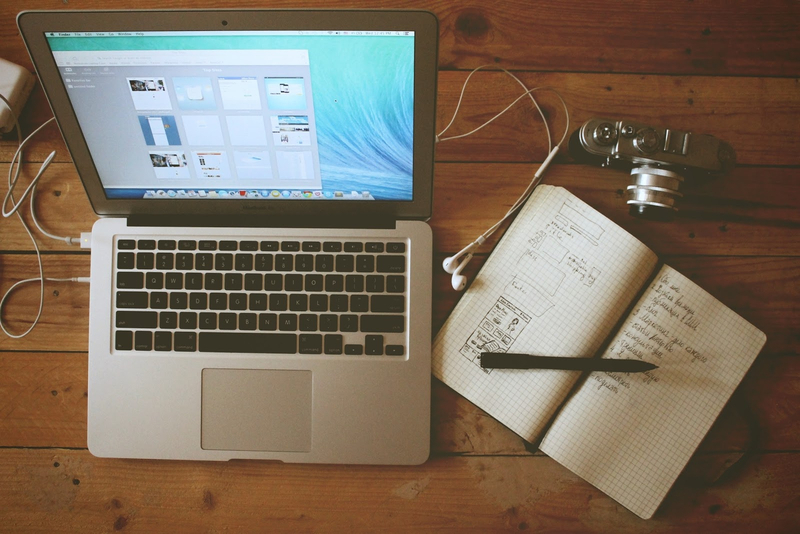 First: Start doing an evening review where you plan your tasks for the next day based on your long-term goals. 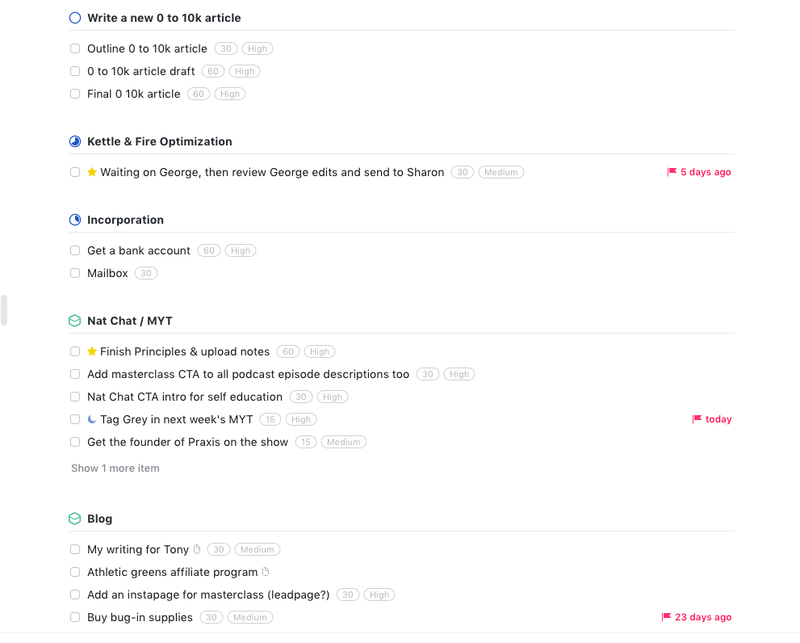 Second: Start tagging your tasks by their time and priority, so you know exactly what to do in what order the next day. Third: Start planning out your calendar in the evenings or mornings, and adjusting it as your day goes. Fourth: Design a simple morning routine, thirty minutes or less, with two or three habits you’d like to start your day with. 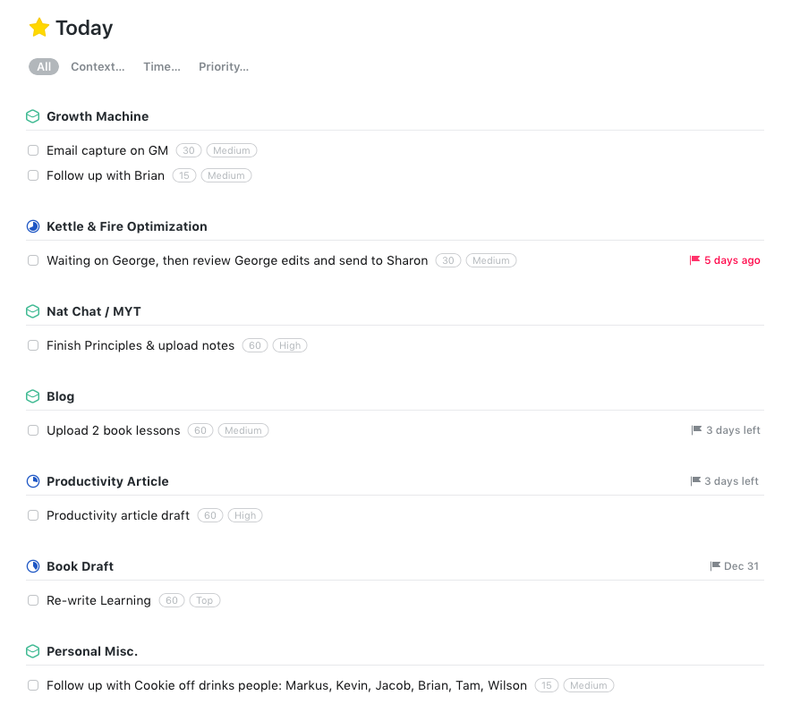 Fifth: Segment your calendar based on different activities (deep work, meetings, calls, etc.) and be militant about not letting commitments slip into the wrong spots. And if you’ve enjoyed this article, be sure to read the others in the “high-output life” series. This has become such an amalgamation of systems over the years that I can’t remember exactly who to credit for what, but it has been primarily influenced by Tiago Forte, J.D. Meier, Cal Newport, Dan Charnas, Peter Drucker, Taylor Pearson, David Allen, and Atul Gawande.